In honor of Dr. Martin Luther King, Jr., I thought I would review a wonderful book about the black community right here in Madison, Indiana. I’ve often thought it would be good for someone to write a basic book that explains for the kind of “average” white person how race matters in their lives. White folks still don’t really have to think about our race as often as people who aren’t white do, but this doesn’t mean that race doesn’t matter. It’s just that the ways in which it matters are often hidden or just not as apparent as it might be. For example, I grew up in a small town like Madison that was mostly white. In my small town, there were really only two black families, and this seemed to be the way it always was and the way it always had been. After reading All We Had Was Each Other, I’m not so sure. Most people in the United States grow up in segregated communities, and so if you’re white, you probably grew up mostly around other white people. This can seem like just “the way things are.” Natural. The black people live over there and we live over here. For me and a lot of folks from small towns, the black people all lived in the city (Cincinnati) and the white folks all lived out in the small towns and country. But there is nothing natural at all about racial segregation. It is deeply institutionalized in our nation with practices like redlining (where first Federal Housing Authority officials and then eventually banks and real estate agents designated areas where minorities lived as being “high risk” and therefore lower in property value) and racial steering (as a white person, have you ever gone looking for a home and been taken into a neighborhood that was not majority white? Have you ever tried to get a real estate agent to take you as a white person to a neighborhood that wasn’t majority white? Real estate agents legally aren’t supposed to talk about race, but that doesn’t mean it’s not a part of standard operating procedure). These say nothing of the more blatant practices of restrictive covenants (which often prohibited homeowners in a neighborhood from ever selling to someone who wasn’t white) and, say, burning crosses in people’s yards to discourage any more of “their” kind from moving in. 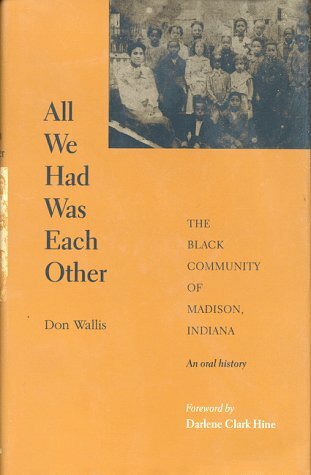 In All We Had Was Each Other, you learn about how the town of Madison, Indiana became 93% white and 3% African-American. Don Wallis, a white man who grew up in Madison himself during the time period he focuses on, collected oral histories of black residents from Madison, many of them no longer living in the town. As Wallis says in his preface, in the Madison he grew up in during the 1950s and 1960s, black people could only live in one section of town. They could work only as handymen, cooks, and maids for white people. Black children attended an all-black school and black people went to all black churches. The hospital had two rooms set aside in the basement for black residents, and if they were filled, tough luck. Black people could not eat in restaurants and had to sit in the balcony at the movie theater. They had to address white residents as “Mr.” or “Mrs.” and they always knocked at the back door. The beautiful WPA era public swimming pool still in operation here, Crystal Beach, was off limits to them. In essence, Jim Crow was in full effect in Southern Indiana. So if you believe that somehow everyone north of the Ohio River is racially innocent, I encourage you to check out this book. That Madison lived under Jim Crow was not completely surprising to me. What was most shocking about these accounts is that the teeny, tiny little area of downtown Madison was completely segregated into two completely different towns and two completely different communities. Downtown Madison is crammed into an area of river valley that is a little over a mile in length and probably less than a mile across at its widest. It is a relatively small, physical space. But when the folks in All We Has Was Each Other were growing up, there was Madison, and there was Georgetown. Pat Cosby, who was born in 1946 in Madison, said, “I remember the boundaries of the Black community. As a kid I knew exactly where I could go and where I could not go. I knew better than to ever go beyond those boundaries….And never, never go past Third Street. That’s where the white neighborhoods were, and I knew I’d get a whipping if I went up there. All the kids in our community knew this.” What comes across in these oral histories is that folks really thought of the space as divided into two towns; Georgetown was where the black folks lived and Madison, or uptown, was where the whites lived. As a sociologist, it’s an amazing example of how space can become so powerfully socially constructed, and a very small space at that. Many of the people Wallis interviewed are successful doctors, lawyers and teachers, but not so many of them live in Madison anymore. And this is how Madison mysteriously became so very white. When this generation of black residents went away to colleges and universities and came back with educations, they found no one in Madison or the surrounding areas was willing to hire them to do anything but mow their lawns or cook their meals. And so they left and went places that would allow them to better themselves. How many other places in the Midwest have this same story? If you’re living in a small town that’s almost all white, you might ask yourself, was the place I’m living in created by the unwillingness of those in power to allow other people to have the same things they do? Is that why there are no black people here? I’m guessing a lot of times, the answer is probably, yes. All We Had Was Each Other is not a book about how horrible it was to grow up in Madison as a black person. A lot of what the folks Wallis interviewed had to say focuses on the strength and resilience of the black community in Madison. They talk about important teachers at the all black Broadway School, like Anna O’Banion, George Guess, Daisy Bishop and the Bentley sisters and how those teachers inspired them to pursue a college education. Frank Inskeep discussed organizing the first NAACP chapter in Madison. They discuss how close, connected and supportive the black community in Madison was. And many of them who have left discuss the pleasure of coming back to visit Madison and bringing their children and grandchildren with them. But if they have to come back, it means that a whole host of talented and intelligent folks are no longer in our town. The Broadway School is gone. Much of the Georgetown neighborhood was destroyed when the hospital in Madison expanded. When folks talk about “historic” Madison, the stories of the people in this book don’t often seem to be the history they’re most interested in. But if you’re interested in a different history, All We Had Was Each Other has a lot to teach us here in Madison and in other communities across the country about a past that isn’t so far away and the segregated reality that we live with today. Robyn, thanks for this fascinating review and post. Not only does the book sound really interesting, but your insights and observations are very astute. This is the kind of thoughtful commentary I love to see on book blogs. Thanks, bibliophiliac. Glad you enjoyed it.